With today’s fancy technologies, tattoo artists have wonderful tools at their disposal. The tattoo machine, however, has not been around for millennia. How then did the ancient tattoo artists draw intricate, permanent designs on the skin? Most ancient cultures used tools like rose thorns, sharks’ teeth, and pelican bones to push pigments into the skin. Like the red ochre and soot, these pigments were also naturally obtained. With the invention of needles during the Iron Age, tattooing quickly adapted to this new equipment. One of the most common tattooing methods is called hand-poking or gently pushing the needle with ink into the skin. Compared to the ‘pricking out’ technique, which involves pushing the needle into the skin and then flicking it out, hand-poking is slower but less painful. Another tattooing method, used among the ancient Inuit, borrows from the concept of sewing. After dipping a thread in ink, the artist sews the thread through the skin to leave pigment wherever the needle enters and exits the skin. The Inuit originally used a sharpened bone to break the skin, but quickly adapted to metal needles when they became available. Hand-tapping comes from Indonesia and requires two wooden sticks. A sharp piece of wood or buffalo horn is attached to a short stick, and a second stick taps on the first stick to push the makeshift needle into the receiver’s skin. An assistant, called a ‘skin stretcher,’ must hold the skin taut throughout the process. With modern automation, today’s tattoo machine is simply a fancier version of these tried-and-true methods. Often called a tattoo machine, this tool features a needle or needle grouping attached to an armature bar. The bar is moved up and down by electromagnetic coils at a rate of up to 3,000 times per minute. 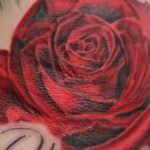 Using the machine, the tattoo artist outlines the pattern with just one needle and fills in large areas with a needle bar containing five to seven needles. Although most modern tattoo artists use some variation of the tattoo gun, some are trying to bring back these traditional methods. In some cultures, the act of inking a tattoo carries religious or nature-related tones, while for others, creating a tattoo gives life to someone’s thoughts or feelings. Either way, tattoo methods have come a long way over the centuries.